Bryant Park Corporation’s Capital Projects Department recently put the finishing touches on our popular Ping Pong Area, created last summer at the Northwest corner of the park. Bluestone slabs, repurposed from our New York Public Library Terrace restoration project, have been set in the ground to provide a sturdy surface beneath players’ feet. 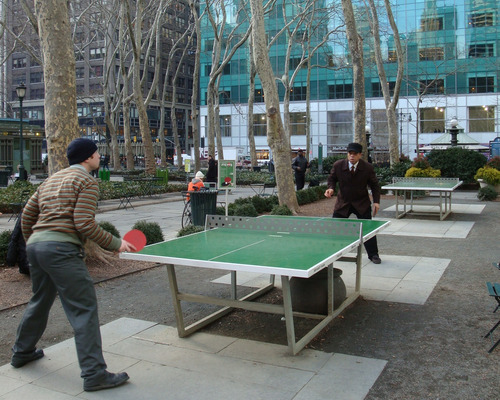 Regardless of the chilly weather, ping pong aficionados have been visiting the park with their own paddles and balls, putting the tables to good use during the winter months. The photo above was taken last week on January 27 as the temperature hovered around 38 degrees! Petanque devotees have also been frequently spotted playing in the park on milder winter days. When the weather permits, amenities like these have helped Bryant Park become a truly active public space, year round. In the summertime we will bring back our Ping Pong Area attendant to monitor a sign up sheet and provide equipment, free of charge, for those who wish to play.